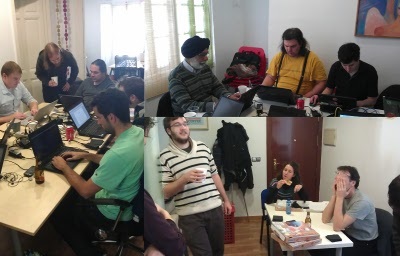 As those of you following the GStreamer development mailing list or the GStreamer Google Plus profile know, we have been having a GStreamer hackfest in Milan over the last few days. We have 17 people here, all hammering away at our laptops or discussing various technical challenges sitting at a nice place called the Milan Hub. A lot of progress has been made during these days with some highlights including work on fixing the use of Gnonlin with GStreamer 1.0, which is a prerequisite for getting PiTiVi and Jokosher running with GStreamer 1.0. Jeff Fortin, Thibault Saunier, Nicolas Dufresne, Edward Hervey, Peteris Krishanis and Emanuele Aina has all been helping out with this in addition to fixing various other issues in PiTiVi and Jokosher. Sebastian Dröge has put a lot of work during the hackfest into providing the basic building blocks for doing hardware codecs nicely in GStreamer, and Víctor Jáquez has been working on making VAAPI work well using these building blocks, with the plan among other things to make sure you have hardware accelerated decoding working with WebKit. In that regards Philippe Normand has spent the hackfest investigating and improving various bits of the GStreamer backend in Webkit, like improving the on-disk buffering method used. 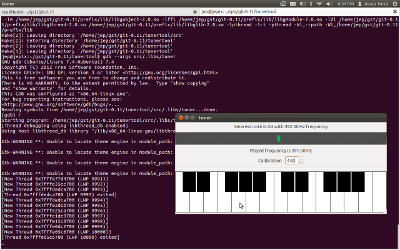 Also in terms of hardware codec support Edward Hervey also found a bit of time to work a little on the VDPAU plugins. Speaking of web browsers Alessandro Decina has been working on porting Firefox to GStreamer 1.0, he has also been our local host making sure we have found places to eat lunch and dinner that where able to host our big group. So a big thank you to Alessandro for this. Wim Taymans has been working on properly dealing with chroma keying in GStreamer, improving picture quality significantly in some cases, in addition to being constantly barraged with questions and discussions about various enhancements, bugs and other challenges. Edward Hervey has in addition to help out with GNonlin also been working on improvements in our DVB support and improving encodebin so that you can now request a named profile when requesting pads, the last item being a crucial piece in terms of allowing me to proceed with Transmageddons multistream support. Stefan Sauer spent time on fixing various bugs in the GStreamer 1.0 port of Buzztard and a first stab at designing a tracing framework for GStreamer. Arun Raghavan was working on various bugs related to Pulse Audio and GStreamer and also implemented a SBC RTP depayloader element for GStreamer. Tim-Philipp Müller has been working on implementing a stream selection flag in order for GStreamer player to be able to follow any in-file hints about which streams to default to or to not default to for that matter. 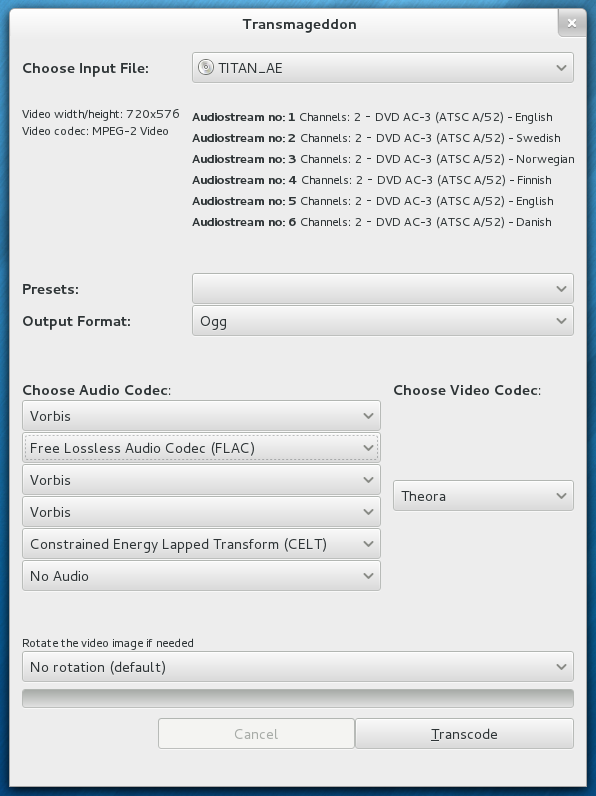 As for myself I been mostly working on Transmageddon trying to get the multistream and DVD support working. Thanks to some crucial bugfixes from Edward Hervey and Wim Taymans I was able to make good progress and I have ripped my first DVD with Transmageddon now. There is still a lot of work that needs doing, both in terms of presentation, features and general robustness, but I am very pleased by the progress made. Title selection screen, needs a bit more polish, but getting there. As you see above you can now choose to transcode to different codecs for each sound stream, or drop the streams you don’t care about. The main usecase for different codecs is to you a different codecs for surround sound as opposed to stereo or mono streams. A big thank you to Collabora and Fluendo for sponsoring us with dinner during the hackfest. Also a big thank you to Collabora, Fluendo, Google, Igalia, Red Hat and Spotify for letting their employees attend the hackfest. GStreamer Conference 2012 Schedule online! I am very happy to announce that the schedule for this years GStreamer Conference is available. The schedule includes talks about GStreamer 1.0, the new GStreamer SDK, GStreamer security and quality and hardware enablement with GStreamer. But we also have a great range of talks on related topics like Wayland, ALSA, V4L and the Opus Codec, so there should be something for everyone. A big thanks goes to the sponsors of this years GStreamer Conference which includes our Gold Sponsor Collabora and our Silver sponsors Entropy wave, Fluendo, Igalia and Google. You can now submit an application as a student to be part of this years Google Summer of Code. So if you want to do a GStreamer project be sure to ping us on IRC (#gstreamer, irc.freenode.net) or send an email to the gstreamer-devel mailing list and start discussing any project ideas you might have, or to ask questions about items from our SoC ideas page.. Details on how to submit an application you can find our our Student information page. Try to submit your application as soon as possible because if you wait until the day before the deadline of April the 6th, then the amount of time available for feedback and improvements will be small and thus decrease your chances of getting approved. A big thanks to Google for making GStreamer part of also this years Google Summer of Code. For those of you who might not know the Google Summer of Code it is basically a program that lets you do a summer internship with various leading open source projects and get paid for it (if you are a student). So if you always wanted to get involved with the GStreamer project and become a multimedia wizard, this is a great way to do so. The process is quite simply, you write a proposal for what you want to do (some possible suggestions and info found here) and submit it to Google when the application period starts on the 26th of March. Before then you would do well to speak with us on IRC or email lists to discuss your project to maximise your chances of getting selected. We have a special Google Summer of Code student information page with information on what the GStreamer project specifically expects of you and your proposal. So for those interested that should be a good starting point. Hope to see many great applications this year on either GStreamer itself or GStreamer using projects. And remember, you don’t have to feel bound by our suggestion list, if you have a great idea for a project that involves GStreamer, then we are happy to mentor it, just be sure to talk to us as soon as possible so we can let you know if we think it is a suitable Summer of Code project.